This tutorial will be showing you how to set up certificate authentication in OpenConnect VPN server (ocserv) on Ubuntu. OpenConnect (ocserv) is an open-source implementation of the Cisco AnyConnect VPN protocol. In a previous article, I explained the steps to set up OpenConnect VPN server with Let’s Encrypt TLS server certificate. Let’s Encrypt does not issue client certificate, so in that article, we used password authentication. 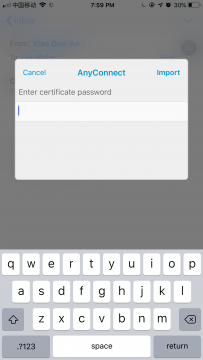 Entering username and password every time can be a hassle, especially if the client software, such as the Cisco AnyConnect app on iOS, doesn’t offer an option to remember password. Many OpenConnect client software can import user certificate, which will free the user from entering username and password. Certificate authentication is also more secure than password authentication. To follow this tutorial, it’s assumed that you have already set up an OpenConnect VPN server with Let’s Encrypt TLS server certificate. We will set up our own CA (Certificate Authority) to sign client certificate. The ocserv daemon should continue using the TLS server certificate issued by Let’s Encrypt, so client software won’t display security warning. We want to use certificate authentication, but Let’s Encrypt does not issue client certificate, so we need to create our own CA. You can openssl to do the job, but ocserv recommends GnuTLS, so I will show you how to use GnuTLS. Install gnutls-bin package. Create a sub-directory in /etc/ocserv/ to hold private keys and certificates. Generate a private key for the CA with the certtool command, which is provided by the gnutls-bin package. By default, it generates a 3072 bit RSA key, which is sufficient. Before generating the CA certificate, let’s create the CA certificate template file. The template file format can be found in certtool manual (man certtool). Add the following lines to the file. Replace placeholders with the appropriate values. Save and close the file. Now generate the CA certificate using configurations from the template file. Now we have a CA certificate file (ca-cert.pem). Now run the following command to generate client private key. Create the client certificate template file. Add the following lines into the file. The uid must be a username in the /etc/ocserv/ocpasswd file. Save and close the file. Then run the following command to generate client certificate, which will be signed by the CA private key. Combine the client private key and certificate in a PKCS #12 file that is protected by a PIN. Note that the Ciso AnyConnect app on iOS doesn’t support AES-256 cipher, so if the user is using iOS device, then you can use the 3des-pkcs12cipher. Now we have the client private key and certificate combined into one file client.p12. In order to keep end users’ private keys secret, users can generate certificate signing request (CSR) with their own private keys, then send certificate requests to admin, who then issues client certificates to users. First, they have to generate private key and the client certificate template using the commands mentioned above. Then generate a CSR with the following command. The request.pem file is signed by user’s private key. Next, the user sends the request.pem and client-cert.cfg file to admin, who runs the following command to generate client certificate. After that, the admin sends client-cert.pem certificate file to the user. To enable certificate authentication, uncomment the following line. If the following line is also uncommented, that means the user must also enter username and password. So if certificate authentication is enough to prove identity, then comment out the following line. If you allow users to chose either certificate authentication or password authentication, then add the following line. Now find the following line. You don’t need to change it. I just want to tell you that 0.9.2342.19200300.100.1.1 represents the UID filed in client certificate. The above line tells ocserv daemon to find the username from the UID field of client certificate. If the client certificate is successfully verified by the CA certificate and ocserv daemon can find a matching username in /etc/ocserv/ocpasswd file, then the client can login. Use the scp command to download the client.p12 file to your Ubuntu desktop. Then install the openconnect client software. You will be asked to unlock client private key with the password. 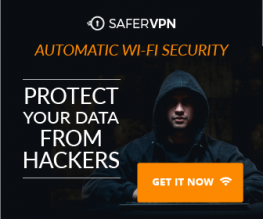 If the password is entered correctly, you should now be connected to VPN server. Download OpenConnect GUI client for Window or MacOS from OpenConnect GUI Github Page. 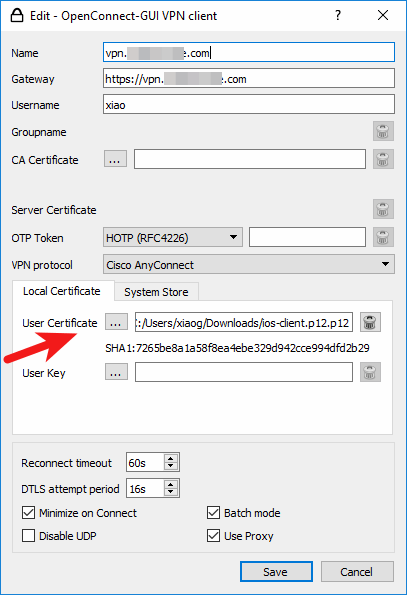 Then create a new VPN connection profile and import the PKCS #12 file to user certificate field. Click the Save button. You will need to enter the PIN to unlock the private key. Once imported, you don’t have to enter username and password anymore. 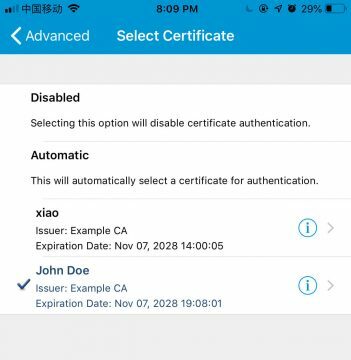 iOS users can use the Cisco AnyConnect app. To import client certificate in AnyConnect app, you can first send the PKCS #12 file to your email address in an attachment. Then open the mail app on iOS. Tap the attachment a few seconds and share it with AnyConnect. Then enter the PIN to import the file. Once it’s imported, edit your VPN connection in AnyConnect. Go to Advanced -> Certificate and select the client certificate. Save your settings. Now you don’t have to enter username and password anymore on your iOS device. The Cisco AnyConnect app doesn’t remember username and password, so in password authentication mode, VPN connection will drop when the phone is not in use. In certificate authentication mode, the app will automatically reconnect to VPN server if connection is dropped.